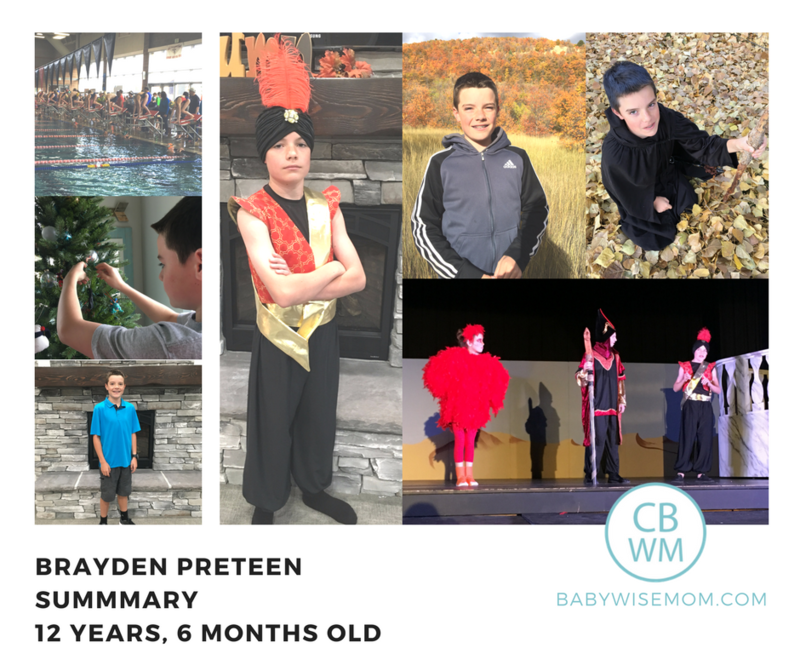 This is a summary for Brayden from 12-12.5 years old. Eating is great and usual. He eats a lot, but he isn’t eating amounts that I find crazy. I should say, though, that my husband eats a whole lot more than the average man. My dad did, also. It will take a lot of food being consumed for me to be impressed. Sleeping is great. Brayden is wanting more to just head to bed without us going into his room to tell him good night. He is growing up! Sniff. Brayden is doing swim team still. He has piano lessons going on. He did the musical at the middle school this fall. That is basically what he is involved in right now. It is enough! The musical is over, but the other things are mostly year-round. School is going great! 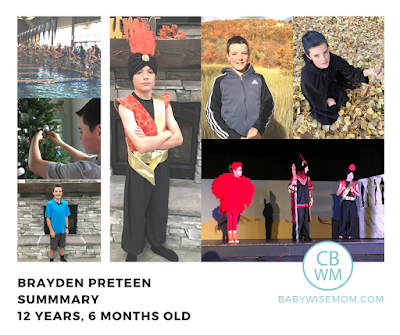 Brayden has loved middle school and has thrived there. He ended up getting a 4.0 in his first trimester. At his parent/teacher conferences, all of his teachers had great things to say about him. At this point, we do not have attitude issues with Brayden. I know this age, a bit younger, and older can be times of attitude and difficulty with dynamics of relationships. I really don’t know, since he is always my first, if this is because it is just his natural disposition. I don’t know if we are doing a good job of allowing him the appropriate amount of freedom. So much about life with him is just a lot of guesswork and hoping and praying we are doing things right 🙂 . Our high school starts at 8 AM so not unreasonably early (when I went ours was 7:20 AM I think, it was early!) It's a tricky thing because yes supposedly there is a period where they fall asleep later but I never had issues with that. I always had to make sure I was in bed at 10 PM to get up at 6 AM (Totally needed 8 hrs sleep at least to function). I never had issues falling asleep at 10 PM, i think it's good habits in part. IF you are in regular routines as you know, your body is used to it and expects it. Honestly I think a lot of things is many aren't in regular routines, they have lots of screen time and other things such as iphones disturbing their sleep or staying up late,etc. There has been all this talk about pushing the start times later for high school but OTOH I think it's not a simple issue. Lots of things have domino effects. TO me it doesn't make sense as if you have sports or after school activity that just gets pushed back, you have to do homework, get to bed later, it's probably the same just rearranged and shifted back. And supposedly research says it's a certain age but then it reverts more normal so why make everything adjust to a relatively short phase? I'm not saying it is ideal but honestly there are seasons where you may get less sleep then ideal (think parenthood!) And i think it's not a simple solution. You have parents who work and leave the house early/take the kids to school then, older siblings who watch other younger siblings, teachers and staff with maybe younger kids on different schedules, impact on traffic flow,kids who go to work after school,etc. It gets very hard to balance. So I'm not sure what will happen here by the time mine are in high school if they are going to shift things later (here all grades are pretty much on the same schedule, it's actually really nice with multiple kids) but for now I'm assuming it will be the same as it is now and will just plan on an early enough bedtime for them to get the sleep they need. I think a lot of the issues are societal and environmental. The kids are involved in so many extra activities and they get home so late and stay up to wee hours of the morning then doing their homework as they got home so late,etc. I think a lot of kids aren't getting the sleep they need (that is young kids and elementary school kids as well) but that's in part due to lifestyle issues. i'm sorry, i was reading kaitlyn's 10.75 year old summary and clicked on post a comment, not sure how it's on brayden's 12.5 yr old summary!